Lava Mountain is the seventh world of Sonic Lost World, which is where Dr. Eggman has built his fortress and the Extractor. As this is the final world in the game, Sonic faces off against each member of the Deadly Six for the last time. In the 3DS version, the player can gather Red Material here. Zone 1 is nothing but a gauntlet on a single rocky planetoid that's constantly being bombarded by volcanic rocks. Zazz, Zomom and Master Zik will land on the planetoid one at a time to get their revenge on Sonic, and once all three are defeated, the Zone is cleared. Each time Sonic defeats a Zeti, the planetoid crumbles, revealing instant death lava pits and giving the hedgehog less room to stand on. The underwater pipe from Tropical Coast Zone 3 returns, and this time things are far more treacherous, as there are now minecarts filled with bombs that will instantly kill Sonic if he touches them; not even Super Sonic is immune to them. There are plenty of short rails throughout the Zone, requiring a series of quick, well-timed jumps to avoid an ever-increasing number of endless falls. The player also has to avoid colliding with moving walls, as that also constitutes instant death. Zone 3 is, without a doubt, one of the longest Zones in the game. Sonic must go through three tiers, with the remaining Zeti: Zeena, Zor and Zavok waiting at the end of each one. Each tier has a 3D section set outdoors with lava pits, Badniks and cannonballs, followed by a 2.5D climb up a mechanical tower with conveyor belts, giant gears and lethal lava that will rise after Sonic. This Zone also has the only use of the Green Hover Color Power in the whole game. The final Zone in the game is a straight-up running battle against Dr. Eggman in his superpowered Eggrobo mech, fought similarly to the Nega-Wisp Armor from Sonic Colors. Super Sonic cannot be used in this Zone. Every Zone in the 3DS version of Lava Mountain has the player simply refight every member of the Deadly Six, with all of them repeating the same strategies as their earlier fights but with more health and their attacks being harder to avoid. Two of the Zeti are fought in each Zone, with Zone 1 having the player fight Zazz and Zomom, Zone 2 having the player fight Zeena and Zor, and Zone 3 having the player fight Master Zik and Zavok. 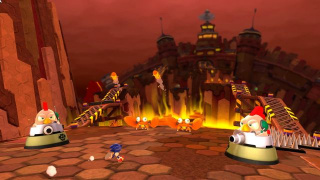 Lava Mountain was also one of the three standard stages of Sonic Runners, and would appear after clearing Episode 17 of Story Mode. It was a Power Type stage, and contained obstacles suitable for Power Type characters such as Knuckles. The stage also appears in Sonic Runners Adventure. This page was last edited on 8 April 2018, at 09:42.